At NEMA Boston, technology enhances daily life while locally inspired architecture, art, and interiors elegantly reflect the heritage of the historic Boston Seaport. Every design detail is intended to create a bespoke living experience—a new kind of home. NEMA is all about intelligently applying technology to make life better. With ultra-fast Wi-Fi in all amenity areas and smart home technology in every residence, NEMA is always at the leading edge of innovation. The myriad tech features include a custom-built lifestyle management app, destination elevators, and DAS-supported building-wide LTE reception. Fiber-optic, gigabit-capable internet; amenity-wide connectivity. For secure and convenient keyless access via an RFID fob, keycard, or mobile app. Equipped with a Lutron Caseta lighting system and ecobee3 thermostats, compatible with Apple HomeKit, Google Assistant, and Amazon Alexa. Dedicated amenity space featuring a leading-edge equipment collection that includes 3D scanning and printing as well as coding and design stations. Destination Technology applies algorithms to group riders based on destination and the number of waiting passengers, resulting in optimal efficiency and convenience. Custom-built lifestyle management app with options to pay rent, submit maintenance requests, manage deliveries and guest access, reserve amenities and services, and more. Fully integrated audio-visual systems in amenities. NEMA Boston features custom-curated artworks and design elements to reflect Boston’s and the Seaport's past and present. The Boston apartment building’s modern façade—designed with ledger stone, bronze paneling, and glass—creates a neighborhood beacon in the historic and ever-evolving Seaport district. The façade's distinctive slant, inspired by the bow of a ship, gently nods to the district’s nautical history. In sync with the Seaport's new status as Boston's innovation hub, a 70-foot LED art wall creates a vivid backdrop to NEMA's arrival experience, with revolving nature scenes from Boston’s environs. The Lobby honors Boston's famous Channel, the 1980s hot spot for live music located nearby in the Seaport. An art wall features custom records that name the most important acts who played at The Channel, highlighting this dynamic decade in Boston’s music scene. Eventually, The Channel turned into a dance club where popular Boston DJs spun records, and, of course, the NEMA Lobby features a DJ turntable driving the music system. A massive steel beam "V," which, along with a curved steel I-beam and rough-hewn granite sculpture by Randy Doering, pay homage to Boston’s role in laying the groundwork for industrializing the Northeast. Artist Tom Burr’s "Blanket" work alludes to the Seaport’s status as a thriving textile shipping hub of the early 20th century. 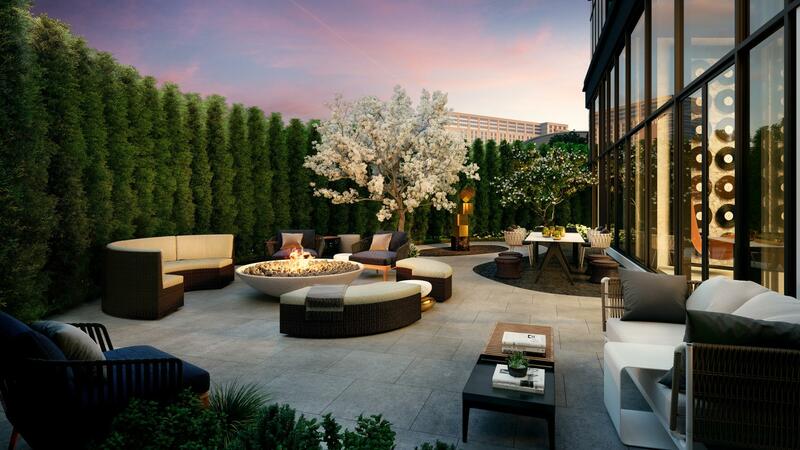 Adjacent to the Lobby is the Garden, an intimate resident micro-park with natural herbs and a modern fire feature. The view into the Garden can be enjoyed from the Lobby through the floor-to-ceiling glass, blending the lines between outdoor nature and interior comfort. The smart, luxury apartments for rent at NEMA Boston are both built and operated with a variety of sustainable features. Ecologically focused strategies include the use of recycled materials, green cleaning products, Energy Star-certified appliances, and eco-friendly finishes with low chemical content to improve air quality. NEMA is an environmentally conscious member of its community, designed to meet demanding LEED standards. Central location in Seaport within walking distance of shops, restaurants, parks, and other neighborhood amenities, as well as multiple modes of transportation, including train, commuter rail, and bus lines. NEMA offers residents secure bicycle storage, preferred parking, and electric vehicle charging stations. NEMA and the surrounding site have been designed to minimize heat island effect by selecting materials that reflect rather than absorb heat. Annual water savings are projected to be equivalent to 5.5 Olympic-size swimming pools of water. Annual energy savings projections are equivalent to powering 140 homes annually. NEMA uses cleaning products and practices with lower health and environmental impact. Crescent Heights is one the nation's leading urban real estate firms, specializing in the development, ownership, and operation of architecturally distinctive mixed-use high-rises in major cities across the United States. The company's 30-year history demonstrates its commitment to creatively designed, uniquely amenitized, and fully serviced residential and hotel projects. The architecture, interiors, and amenities of each Crescent Heights community are infused with the history, climate, and character of the building's local neighborhood. With a focus on both public and interior art and extensive lifestyle programming, Crescent Heights manages its projects to create authentic, positive experiences.